The Horseware Ice Vibe Boot has an updated look and design with a neoprene outer, elasticated inner pockets, soft binding and secure Velcro. Contoured to fit the lower leg, Ice-Vibe boots can be used on both front and hind legs. These boots are easy to use; first wrap the cold packs around the leg, then place the boots on top of them. The stretchy inner pockets allow for easy insertion or removal of vibration panels, and secure Velcro fastenings prevent slipping. The updated look and feel of the Ice-Vibe boots now includes a smooth outer to repel shavings and beaded gel packs for optimal performance and fit. The Horseware Ice Vibe Boot is an innovation in leg circulation therapy and uses a combination of vibration and cold therapy to boost circulation and reduce swelling. Ice Vibe Boots are fully rechargeable vibrating boots that improve blood circulation, ease soreness and lessen swelling in the lower leg. Horseware Ice Vibe Boots can be used to prepare the legs for exercise on a low vibration setting without the cold packs by stimulating blood flow to the legs, as well as being used after exercise to help the legs recover. Prepare - Use Ice Vibe Boots with only the vibration pads to prepare for activity and stimulate blood flow. 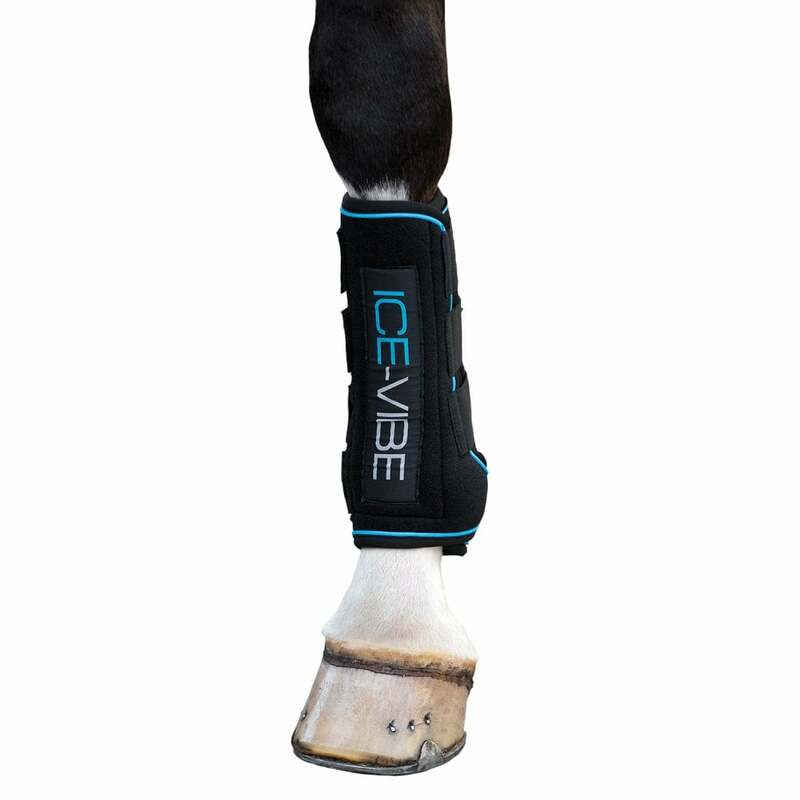 Treat - Ice Vibe Boots can help to improve the realignment of the tendon fibers during the healing process. Using cool boots on their own only prevents inflammation as they resist blood flow and slow down the metabolism. Ice Vibe on the other hand uses a combination of cold and vibration to minimise swelling whilst encouraging blood flow and therefore speeding up the healing process. Repair - The natural blood supply to the lower limbs of your horse is very poor. Vibration stimulates blood flow to the legs which brings nutrients with it and removes waste, therefore ensuring healthier limbs. Please ensure you refer to the user manual before use as this gives much more advice on how to use Ice Vibe theraputic boots and the best settings to start your horse on.